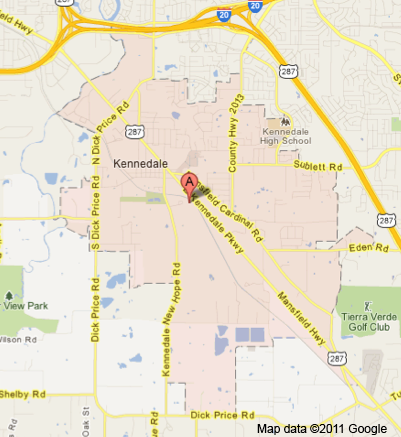 The city of Kennedale is ideally located in Tarrant County near major highways I-20 and 287. These thoroughfares serve as crossroads for traveling across the Dallas- Fort Worth metropolitan area. In Kennedale, the travel times are minimal and with two international airports a convenient drive of less than 25 miles away is it easy to reach even the farthest destinations. The 7,000 residents who proudly call Kennedale their home enjoy many city led events including Brickworks Arts & Music Festival, a Christmas tree lighting, Bark in the Park, Kidfish, and many more. Kennedale also has a senior center, a library, parks and even a municipal building for reservation. This city is located near two shopping centers and amongst many restaurants that each provide a unique dining experience. Kennedale is favorable and family orientated with something for everyone. Kennedale ISD serves a mission to partner with families and the community to provide opportunities for academic excellence in a safe and supportive environment so that today’s students can become tomorrow’s leaders. Being a school district that is truly, “committed to excellence,” KISD displayed this motto by having earned 8 academic distinction designations from the Texas Education Agency. Across five campuses KISD administration is dedicated to provide an innovative and encouraging environment for the students of each school to learn and grow. To discover more of why Kennedale is the right place to live, visit the links below.